The government will explain to parliament the need to raise electricity rates before implementing the rate hike, U Soe Myint, deputy permanent secretary of Electricity and Energy, said. The time is right to welcome international investors, as well as partners and friends, as Myanmar is transforming into a developed nation, enjoying the fruits from such varied sectors as politics, economy, social welfare, and culture. Almost 10% of the population of Myanmar is now resident overseas. Migrant workers from the country have hit 5 million, against a resident population of 54 million, according to an official from the Ministry of Labour, Immigration and Population. United Nations has called for $920 million in aid for around a million Rohingya refugees currently putting up in refugee camps of Bangladesh. Officials with the Yangon Region Public Health Department have reported an increase in measles cases since the beginning of the year, according to a Myanmar media report. In 1978, the World Health Organization (WHO) implemented the global strategy for ‘Health for All by the year 2000’ and acknowledged that preliminary healthcare is the first basic requirement of the people. Of the total population of Myanmar, 70 per cent live in rural areas and the nation provides preliminary healthcare for them and the rest of the citizens. EME-Myanmar, a Yangon-based investment company, together with Nest Tech, the Vietnam-based venture capital firm, has invested a six-digit sum in Mote Poh, a local start-up focusing on providing employee benefits services for companies, according to a statement by Mote Poh. “Reforms towards a superior education system will be made through better policy and procedures,” said Union Minister for Education Dr Myo Thein Gyi at his meeting with the rector, the pro-rector, faculty members and students of Yandanabon University in Mandalay yesterday. 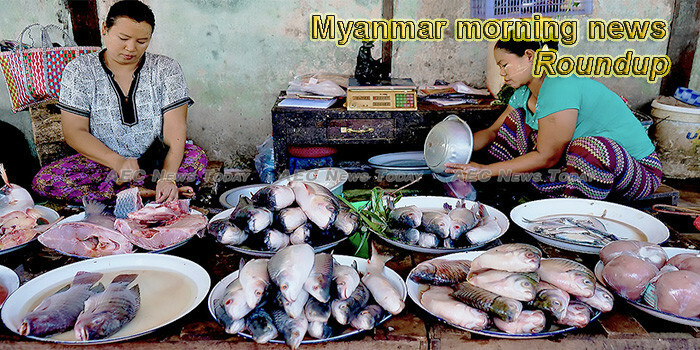 Myanmar’s small and medium enterprises (SMEs) are planning to ship value-added products to the Republic of Korea, said U Aung Kyi Soe, the general secretary of the Union of Myanmar Federation of Chambers of Commerce and Industry (UMFCCI). People were seen busily entering Myanmar’s traditional Htamane (sticky rice)-making competitions in two major cities of Yangon and Mandalay Saturday with high spirit, accompanied by traditional music groups and fans. Police detained a Myanmar national and seized drugs believed to be syabu and heroin worth RM367,000 from a barn in Bedong, near here on Thursday evening. Myanmar generates about 12,000 tons of garbage every day where plastic waste accounts for 15 per cent of the total waste, according to a survey by Thant Myanmar, a grassroots movement fighting plastic pollution in Myanmar. While upgrading the Yangon City circular railway, the Danyingon-Mingalardon-Paywetseikkon rail road is being renovated, with plans calling for its completion within six months to ensure the convenience of commuters, said U Min Aung, the project engineer for the Yangon circular railway upgrading project. The edible nest of the black-nest swiftlet from the Myeik archipelagoes and Kawthoung areas in Taninthayi Region have been shipped by sea to a new foreign market, Singapore, according to a news release from the Ministry of Commerce. Myanmar’s army chief, who is facing international calls that he be prosecuted for genocide against the Rohingya Muslim minority, has denied any systematic army persecution and said such accusations were an insult to his country’s honour. Authorities from the Traffic Rules Enforcement Committee, Traffic Police Force, in Yangon have ensured that traffic will flow smoothly while the film Line Walker-2 is being shot in Yangon. Myanmar State Counsellor Aung San Suu Kyi said at meeting with people held in Kawthaung that the Tanintharyi Region government was weak in reaching out to people. Trust and relationship building between investors and entrepreneurs is really important to grow a start up or a business. Trust, or ‘yone kyi’ in Burmese, is a key component in society. The word is a compound of ‘yone’ and ‘kyi’ and carries significant meaning. Yangon city centre will be experiencing temporary road closures and diversions for a total of eight days due to filming of a Hong Kong-Chinese crime/action film, Line Walker-2, and drivers have been urged to use alternative routes, according to a notice from the Yangon Region Traffic Enforcement Supervisory Committee on Friday. A traditional festival to celebrate the Myanmar delicacy Htamane began at the Maha Muni Pagoda in Mandalay yesterday, attracting local and foreign travellers. A recent release by the Office of the Commander-in-chief of Defence Services, Myanmar had said that the Tatmadaw Kyee (Myanmar Army) have captured more outposts, arms and ammunition of Northeast rebels operating from their soil. Myanmar’s powerful army chief has given a rare foreign media interview to insist there was no “certain proof” the military had persecuted the country’s stateless Rohingya Muslim community. DRIVEN by surging demand from European and South American buyers, Myanmar’s leading manufacturer and exporter of rattan, bamboo and lacquerware products plans to ramp up production and sales in the next few months, according to Stellabeth Swezin Le, director of business development at Bella Interiors Co.
Myanmar Metals Limited (MYL.AX) has ended the week in the black, yielding positive results for the shares at they ticked 8.70%. In taking a look at recent performance, we can see that shares have moved 22.95% over the past 4-weeks, 5.63% over the past half year and 19.05% over the past full year.